High Voltage Relays target automatic test systems. 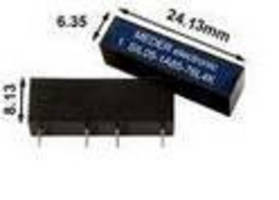 Housed in epoxy sealed, single-in-line package measuring 24 x 6.4 x 8.9 mm, HV Series High Voltage/High Current Reed Relays offer standard coil selections of 5 or 12 V with or without diode suppression. Series can switch up to 1,000 V and carry up to 5 A for up to 50 msec at consistent repetition rate or 10 A at pulsed current for up to 10 Âµs. Relays can also dielectrically hold off up to 4,000 V across contacts as well as between contacts and coil. Miniature High Voltage Single-in-Line Relays-4kVDC Voltage Hold-off! Introducing our newest and smallest High Voltage/High Current Reed Relay Series! The SIL HV Series High Voltage/High Current Reed Relays is an epoxy sealed, single-in-line package measuring only 24mm x 6.4mm x 8.9mm. An optional offset pin-out measuring 29mm x 6.4mm x 8.9mm is also available. Standard coil selections include 5 or 12 volts with or without diode suppression. This series can switch up to 1000 volts and carry up to 5 amps for up to 50 milli-second at a consistent repetition rate or 10 amps at pulsed current for up to 10 micro-seconds. The relays can dielectrically hold off up to 4000 volts across the contacts as well as between contacts and coil. The SIL HV Series is especially suitable for use in automatic test systems, testing high power MOS-FETs. These rugged semi conductors have very high initial peak current capability and require a reed relay that can carry high current pulses for hundreds of millions of operations. These relays come standard with an internal magnetic shield making them an ideal choice for close stacking matrices. Due to their small size, high current and high voltage capability, the SIL HV Relays are also an appropriate match for several medical device applications such as portable defibrillators. These reed relays are RoHS compliant and UL approved.